This commercial building was constructed in the early 1920's and over the years has been the location of a number of retail businesses. The property had gone into severe decline and virtual abandonment until 2002 when it was acquired by the San Angelo Museum of Fine Arts. In a joint venture with the Upper Colorado River Authority, the museum restored this building and for over seven years it was used as an education center by the UCRA. The museum will now operate an art gallery at this location. In recognition of the numerous environmentally based exhibitions and programs that have taken place here, we have decided to name the space Gallery Verde. 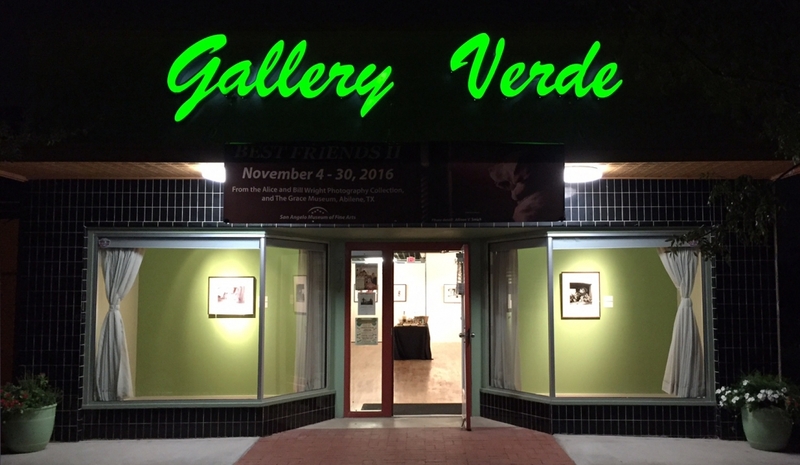 Gallery Verde is looked upon as a gallery of the museum and is to be used to highlight the work of outstanding individuals, groups and contemporary collections. Exhibitions in Gallery Verde will provide educational content, inspiration and information to the community in accordance with the museum's mission. The gallery space is meant to create awareness in all aspects of environmental knowledge including human social interaction and concerns. Artists, groups and collections are expected to be of the highest qualities and presented professionally. Our premier exhibit features over forty works created by leading artists from around the country who participate in the museum's first national "En Plein Air" competition. Fittingly the artists have reflected on the constructed as well as natural environments of our region. If you are interested in exhibiting your work and feel your work meets the above criteria, please contact Shaydee Watson at 325-653-3333. You can also email culturaldistrict@samfa.org for more information. Constructured ClayScapes features ceramic sculptures, vessels, and installations that are explorations of form, color, texture, time and space. These Constructed Remnants of Beauty and decay stand in as moments and monuments that celebrate life’s journey. Featuring artists Paul S. Briggs, Nom Ceramics, Jeff Forster, Eric Jackson, Diana Kersey, Jennifer Masley, and Todd Van Duren. (November 15-17, 2018) A collection of photography from San Angelo's Concho Valley Photography Club. What's coming Out of It? (July 13 & 19, 2018) Rockport is Austin-based artist Elijah Barrett's account of the weeks and months after Hurricane Harvey swept through the community of Rockport, Texas and the surrounding area. (June 21, 2018)Plein Air San Angelo is an open artists group focused on encouraging artistic growth. Exhibit of local artists within the community. (April 20-23, 2018) This show offers portals and springboards into other worlds and states of being through mostly figurative representations. These artists are telling stories that can help describe our cultural narratives and collective realities. Artists include Alejandra Almuelle, Jolea Arcidiacono, Susan Bell, Carl, Block, Max Butler, Pat Johnson, Ty Johnson, Billy Ray Mangham, Yana Payusova, James, Tisdale, Jamie Lea Wade, Jess Wade, and Karen Woodward. (February 15, 2018) On view were works by 13 members of the gallery's Contemporary Texas Regionalism group, offering a grand revue of the best narrative art being produced in the state today. Participating artists included Randy Bacon (Abilene), Mary Baxter (Marfa), David Caton (Utopia), Margie Crisp (Elgin), Fidencio Duran (Austin), Pat Gabriel (Fort Worth), Billy Hassell (Fort Worth), Lee Jamison (Huntsville), Laura Lewis (Mason), William Montgomery (Elgin), Noe Perez (Corpus Christi), Jeri Salter (Round Rock) and Debbie Stevens (Cypress). All of these well-established, mid career artists are distinguished in their own right. (December 16, 2017 - January 18, 2018) Omisade Amy Gerhauser's Pacific Gyre Series deals with issue of plastic debris in the ocean; pre- and postconsumer plastic waste breaks down into small pieces and is indefinitely trapped in swirling oceanic currents called gyres. The plastic is consumed by marine animals such as the Albatross who starve due to the indigestibility of plastic. (November 2 - 5, 2017) Art Show and Sale benefiting the Lake View High School and Lincoln Middle School Mariachi Program. Artists include Anthony Fuentez, Dario Avalos, Gabree Torres, Michelle Cuevas, Raul Ruiz, Wendy Woodring, and Yolanda Rayos. (October 5 - 13, 2017) Forged art objects created using traditional and contemporary blacksmithing techniques. Found iron brought to life and exploration of the plasticity of iron at hight temperatures. (March 31 - April 4, 2017) John Hemphill, local photographer, has had an abiding interest in San Angelo's International Waterlily Garden and he has made four different shoots of the garden, capturing the special qualities of light available at sunrise, sunset and late on a cloudy afternoon. (February 16 - 25, 2017) A collection of photography by artists Ernie Charlesworth, Todd Clary, Jana Jenkins, Mickey Lanty, Charles Luker, Christine McCormick, Jackie Thompson, and Bill Yeates. (December 9 - 15, 2016) Collaborating artists Eric and Morgan Grasham combined taxidermy with ceramics, painting, and digital media for this contemporary cabinet of curiosities. (November 4 - 30, 2016) A collection of photography catching a special moment in time of man's best friend, the dog. The photographs were on loan from The Grace Museum in Abilene, Texas and from the collection of Alice and Bill Wright. (May 19, 2016) Featured both new studio and Plein Air paintings. (May 12-14, 2016) Emily was in town as part of a collaboration with the San Angelo Civic Ballet production, We Are... She painted an orginal piece live onstage during the event. At the same time, she had an exibit featuring original oils and prints of abstract and impressionistic landscape art at Gallery Verde. (April 15th - 17th, 2016) A group show featuring 11 ceramic artists. Alejandra Almuelle, Jolea Arcidiacono, Susan Bell, Ovidio Giberga, Pat Johnson, Marianne Levy, Billy Ray Mangham, James Tisdale, Jamie Lea Wade, Jess Wade, and Amanda Wood. (January 29 - 30, 2016) Solo show by JoElla Mendez. Featuring mixed media and abstractions on canvas. (November 19 - 29, 2015) John Mattson and Karen Zimmerly's exhibit of photos of small Texas towns. "Our photographs are our homage to time and the irony that can come from the contradictions inherent in transformation." 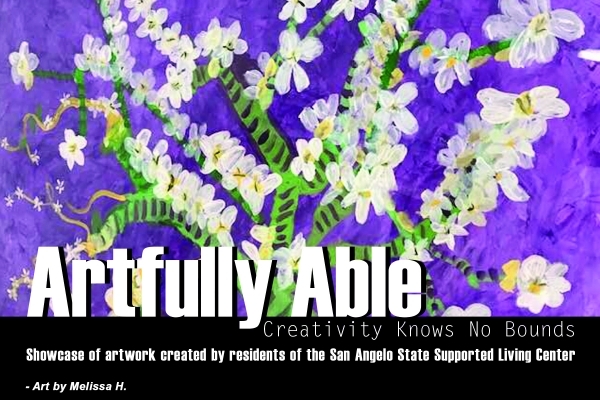 (September 17-19) Paintings that grab a moment in time painted by San Angelo PASA artists. The gallery show featured local EnPleinAir artists JoNell Richardson, Leslie Sealey, and Jack Price. (May 2015) Husband-and-wife artist team Eric and Morgan Grasham exhibited new works that played with visual reality in Flirting With Spacetime.